Happy birthday, iTunes App Store. Apple‘s App Store turns six today, and now offers consumers over 1.2 million apps, which have been downloaded 75 billion times, according to the most recent official data shared by the company. But the business can sometimes be tough for app developers, and new numbers out this morning from two different analytics companies help prove this point. More than 21 percent of the apps that entered the App Store since its debut are now “dead,” notes one firm, while another is seeing a trend it calls “app burnout” now emerging. This latter trend indicates, perhaps, that many apps are seen as disposable by users – they’re things we play with until we get bored, finish a task, or until the next great new thing comes along. Unlike the days of boxed software, app developers today don’t have to just make sales. They have to find and retain loyal users, keep engagement high, consider a variety of revenue models including also mobile advertising and in-app purchases, and work to maintain a highly ranked position in the App Store’s charts, which are managed by sometimes inscrutable and ever-changing algorithms. According to analytics firm Adjust, to date, over 1,601,413 total apps have been uploaded to the App Store over the years, but currently only 1,252,777 apps are available. Most of the “dead” apps that have exited the App Store since its debut are in the Books (27%), Entertainment (25%) and Utilities (25%) categories, it says. 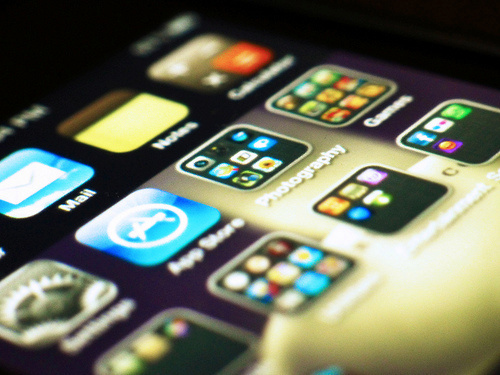 Meanwhile, the App Store continues to grow, with as many as 60,000 new apps added monthly. Adjust sees no sign of that slowing down. The company predicts by App Store’s 7th birthday, another 578,000 apps will have been added to its ranks. And by January 2016, it expects that another 952,977 will have gone live. Those numbers seem about right. Based on figures Apple itself has previously shared, the App Store’s growth has not yet begun to taper off. The company added 250,000 iOS applications to the store from 2012 to 2013, in between its annual WWDC announcements. The year before, it had added 225,000 applications (between 2011 and 2012), and before that, some 200,000 new apps had arrived. There are now some 9 million registered developers building for iOS, up 47 percent over last year, Apple CEO Tim Cook recently said. Last year, the company did $10 billion in sales, and through its revenue-sharing agreements with developers, has paid out $15 billion to date. Consumers are downloading 800 apps per second, Apple says, with over 75 billion downloads to date. But amid this growing crowd of mobile applications, many apps never see the light of day. Adjust refers to the longest of the long tail as “zombie apps” – apps that don’t attract enough attention to regularly receive rankings in the App Store’s top lists. Specifically, the line between a living app and a zombie app was set conservatively, Adjust says – an app had to rank on any of the 39,171 App Store top list on two out of three days over the month. Over the years, the number of “zombie apps” has grown, the firm found: by last month (June 2014), there were 79.6 percent zombies (953,387 out of 1,197,087), up from 77 percent in May 2014. And these figures are up from last year (June 2013), when 70.4 percent of all apps were zombies. What that means for app developers is that the large majority cannot count on the App Store’s top lists for discovery. Apple has been addressing this problem, in recent days, with changes arriving in iOS 8. The iOS 8 App Store introduces more subcategory lists, app bundling, search improvements including related search suggestions and search trends section, and more. And most notably, iOS 8 also brings the App Store directly into the mobile operating system itself. Now, when you pull down on the homescreen to search across your device via Spotlight Search, you may be shown app suggestions from the App Store in your results. 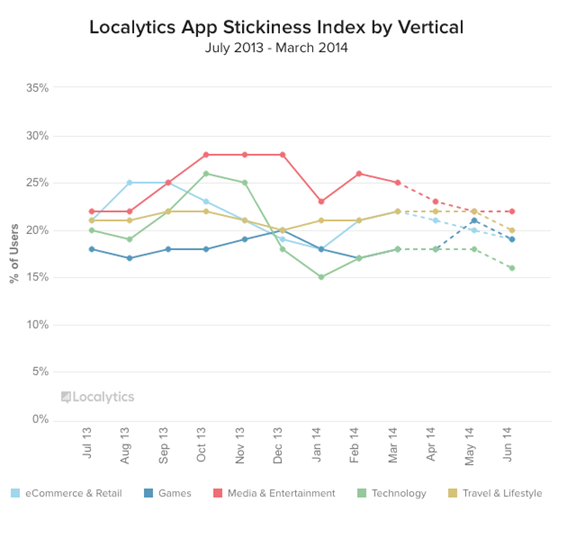 Meanwhile, a related report from Localytics also out today, points not to the problems with app discovery, but rather the issues around retaining users – or “app stickiness,” as the firm calls it. Overall app stickiness – an average of an app’s Power Users and Loyal Users which takes into account both engagement and loyalty – remains at 22 percent, it says. Media and Entertainment apps have the highest stickiness while “technology apps” (e.g. a timer, a calculator) and games have the lowest, at 16 percent and 19 percent respectively as of Q2 2014. Power users, who go into apps 10 or more times per month, are now 32 percent – which is the first time iOS has been even with Android on this metric. (Previously, Android had more Power Users). Loyalty, however, is better on iOS at 24 percent versus Android’s 21 percent. But Localytics also points to an emerging trend referred to as “app burnout.” Since 2011, the percentage of Power Users has always been greater than Loyal Users, and now those figures are diverging even more, the firm says. From Q1 to Q2, Power Users increased by 1 percent while Loyal Users decreased by 2 percent. In Q2, the 25,000 apps Localytics measured had an aggregate of 26 percent of Power Users and 17 percent of Loyal Users, which could be an issue for app developers because Power Users will often use an app heavily in a short period of time, then stop using the app entirely when they reach an “engagement ceiling” – like completing a game, a task or specific function. Many apps are used like this from utilities to games, but even other apps – like photo-sharing, shopping or social apps – are seeing burnout trends that indicate some users don’t necessarily “finish” with the app, they just stop using it for some reason. As the App Store continues to grow, the challenges developers face today will grow, as well. The top charts are already difficult to break into, and so far, Apple has not yet deeply embraced the power of social networking as a way to share apps among friends and other larger audiences. This leaves room for Facebook to swoop in with App Install ads and make a killing. As the App Store expands, developers will need to figure out new ways of getting their apps found, not only via Facebook, but through other advertising and marketing initiatives. And once installed they need to work at keeping their current users engaged.